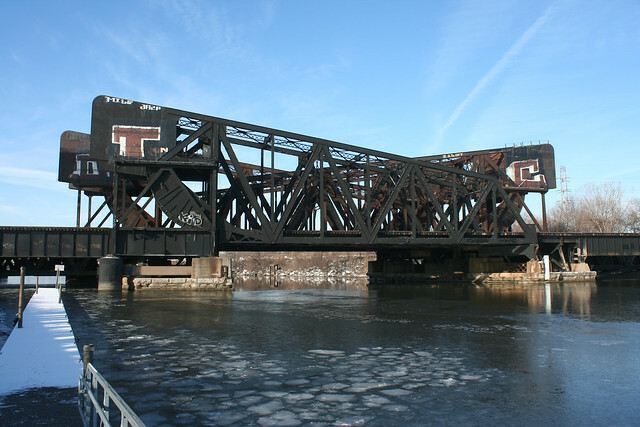 Swing bridges are quiet curiosities – if it seems odd that a bridge should move, at least it’s only moving sideways. 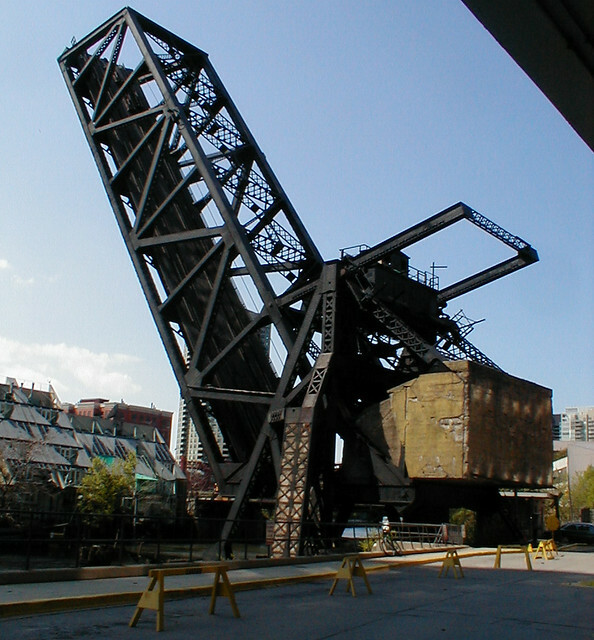 Bascule bridges, by contrast, are utterly bizarre. If bridges aren’t supposed to move in the first place, then they really are not supposed to upend themselves into the air. That a flat sidewalk or roadway should become a vertical surface defies all logic and expectation. 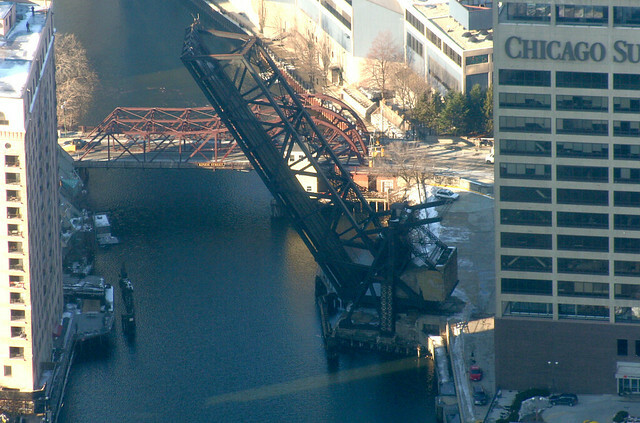 Chicago’s roadway bascule bridges – including all the ones downtown – are elegantly slender, partly by necessity – crowded downtown streets don’t have a lot of room to spare. 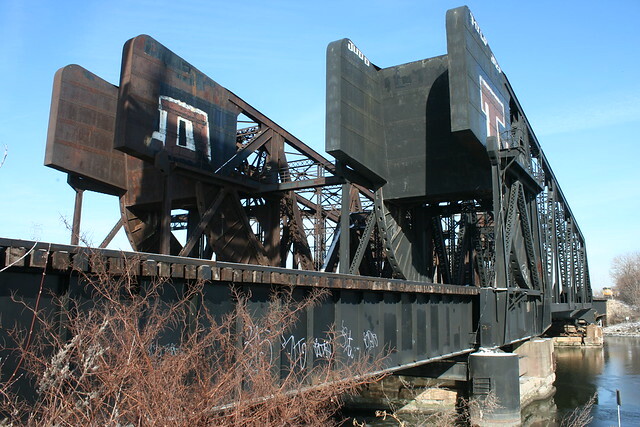 By contrast, the area’s numerous rail bascule bridges sport gigantic superstructures and enormous hanging counterweights, visually spelling out the defiant nature of their function – the titanic forces required to span a waterway, support a train, and occasionally turn the whole affair on its side. 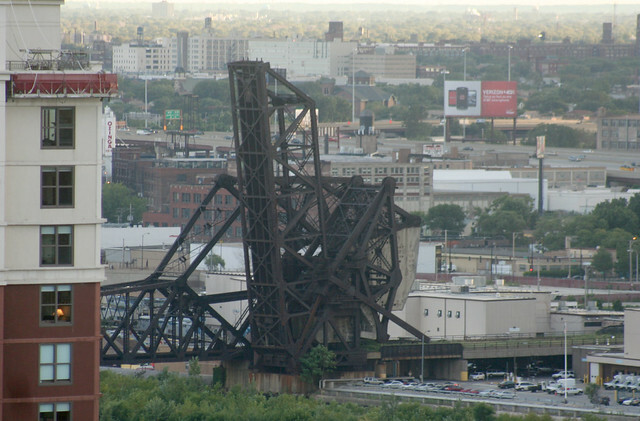 Variously known as the 8-track bridge or the scissor lift bridges, this complex conglomeration of steel is one of Chicago’s most unique sights. 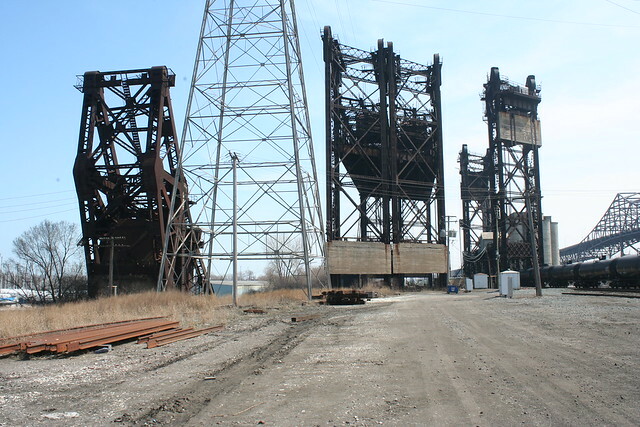 Just south of Western Avenue, the “bridge” is actually four bridges standing side by side, supported by common foundations. Each originally carryied two sets of railroad tracks. 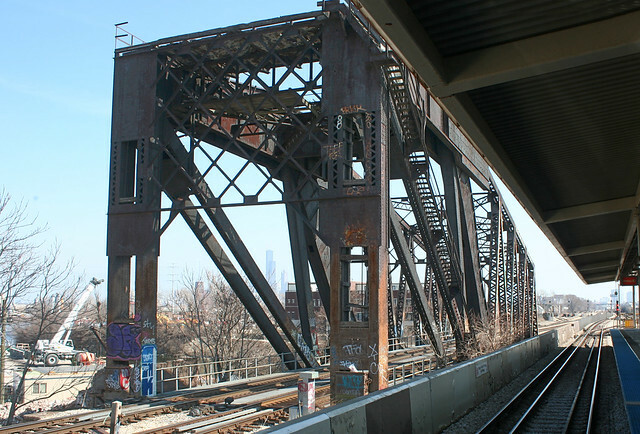 The western two bridges – seen above, rusty brown from lack of maintenance – are now abandoned, with tracks removed. The eastern two, however, still see many freight trains a day. 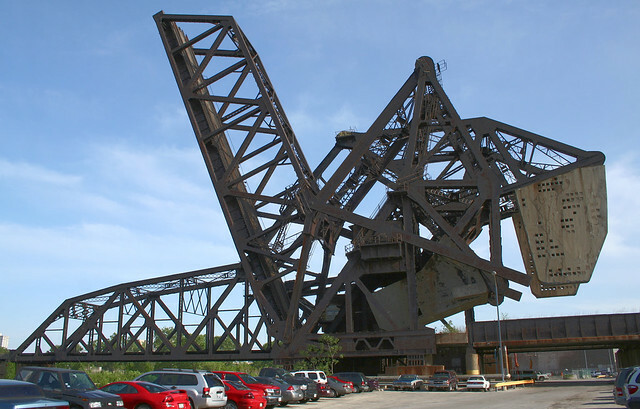 The bridge type is known as a Scherzer rolling lift bridge – to open up, the entire span would literally roll back on the rounded arcs visible, pulled down by the massive counterweights hanging from the structure. 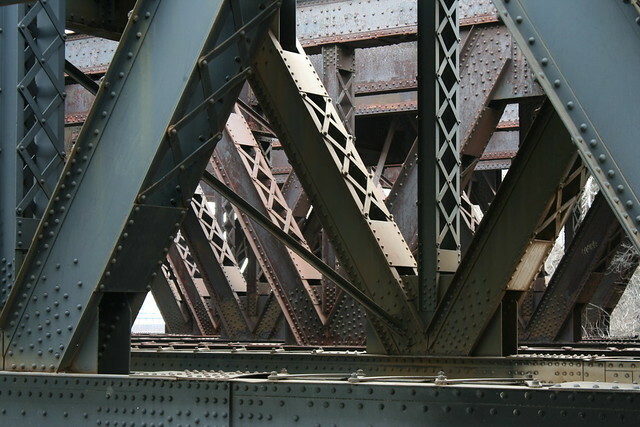 Each bridge is a single-leaf structure, though the close spacing, alternating opening directions, and shared foundations have lead some sources to refer to them as double-leaf. The 8-track bridges are no longer operable, and their motors have been removed. Curiously, there are no images online of the bridges in the open position, nor any indication of when the bridges last opened. 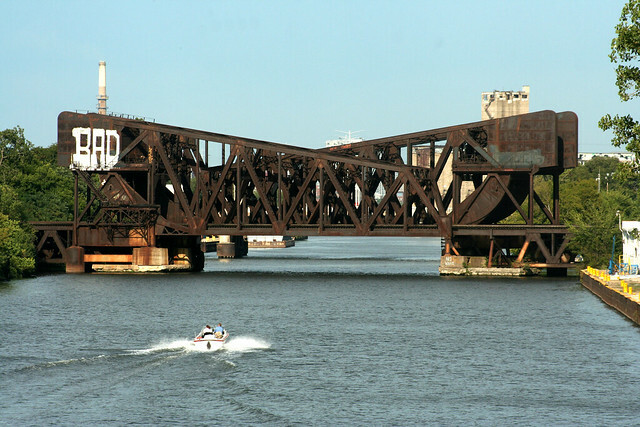 Fixed in their closed position, they constitute the lowest bridge on the canal, with only 17 feet of clearance – a landmark by which boat clearances are measured by pleasure cruisers doing the various waterway circuits that pass through Chicagoland. 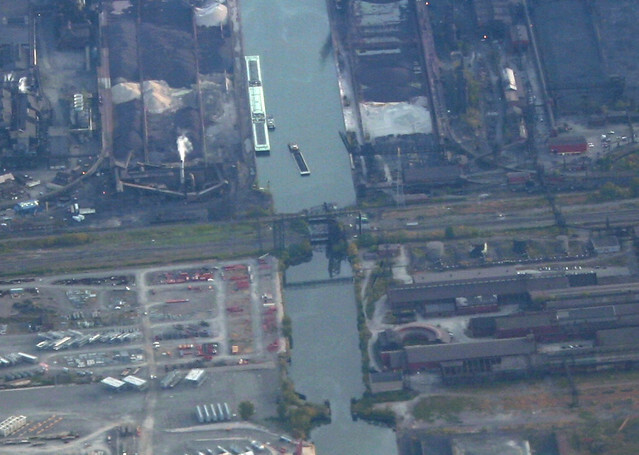 Boats unable to pass below them must instead take the Cal-Sag canal to reach Lake Michigan. 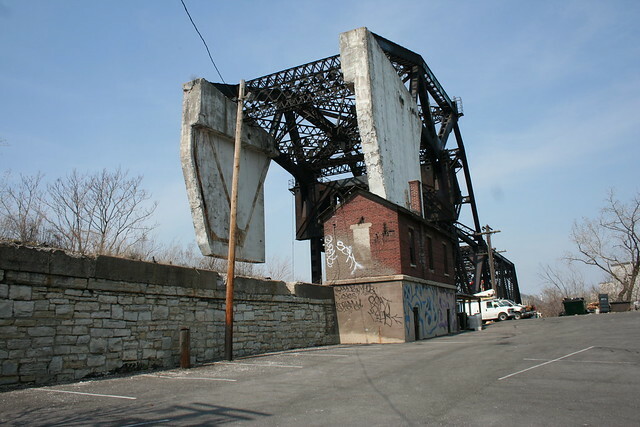 The nearby Western Avenue road bridge was itself a lift bridge, with an impressively massive superstructure that has since been removed – see images here. 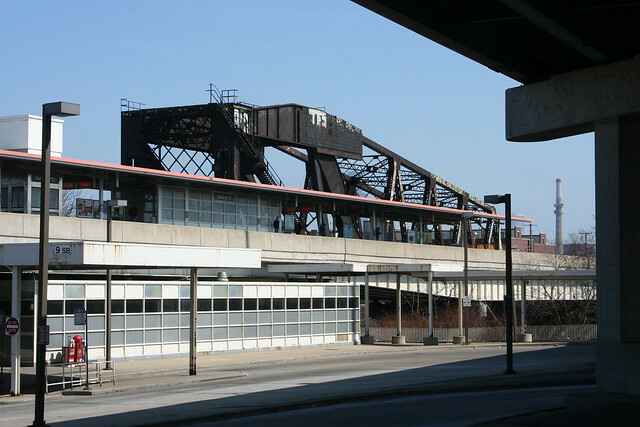 This smaller bridge sits next to an Orange Line El stop, and spans a short branch of the river that run southward before abruptly terminating north of Pershing Street. Bridgehunter.com dates it to 1906. 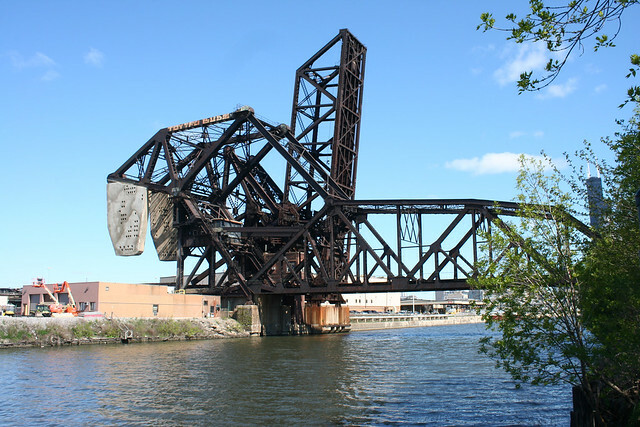 The most monstrously huge of them all, this pair of lift bridges crosses the Chicago River just south of Roosevelt Boulevard. 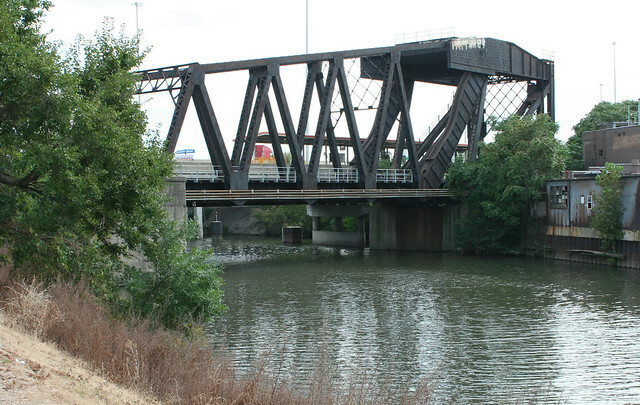 The 1919 bridge was originally a few hundred feet east, as was the river itself. 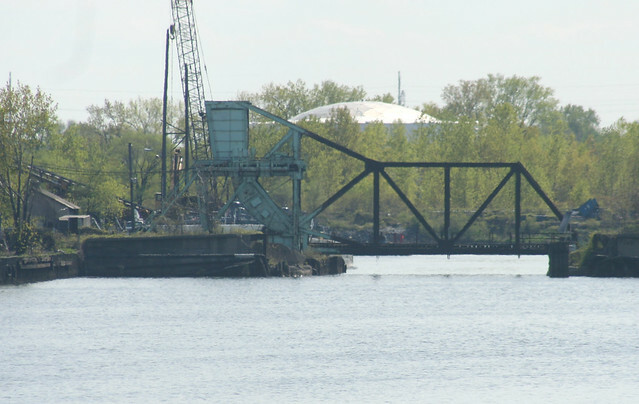 When the river was straightened, the 1930 bridge was built, allowing the older bridge to be moved alongside it without disrupting rail traffic. The older bridge was shortened at this time since it had less river to cross. 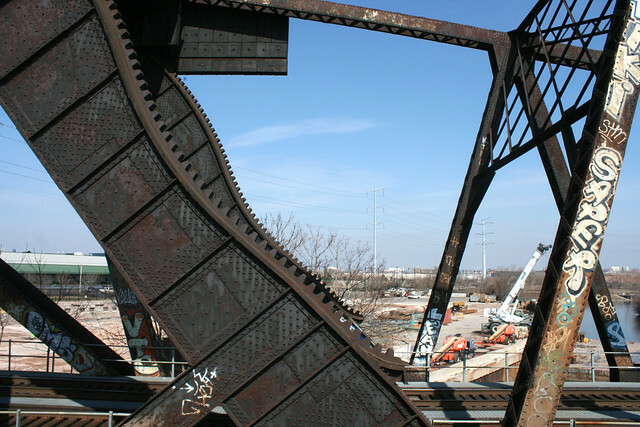 If you’re ever lucky enough to see this mass of steel in motion, you’ll discover that the heavy angled piece is actually hinged at both ends – the counterweight section hoists the bridge up not as a contiguous piece, but through this pivoting system. 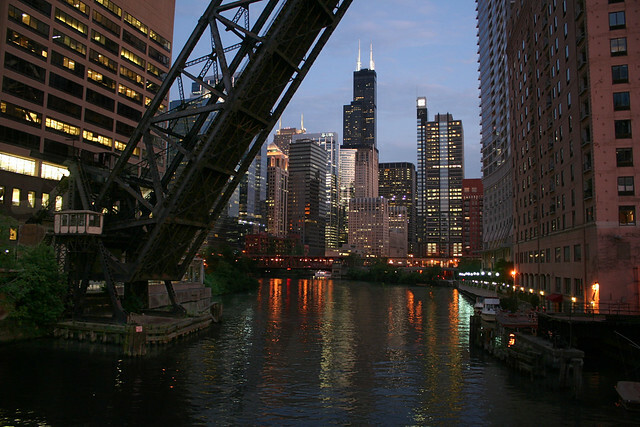 The city has posted an amazing video of it, and many other bridges in motion, here. 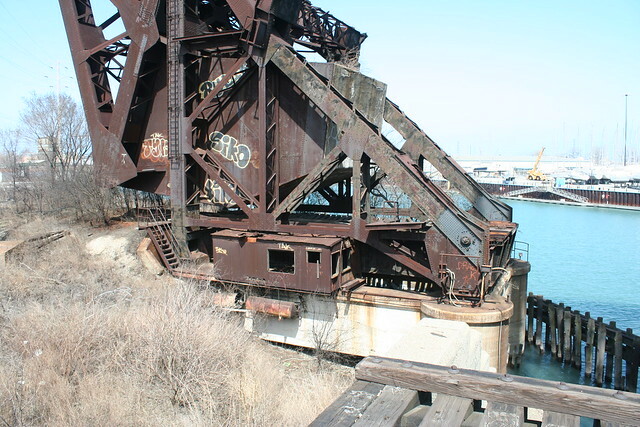 The abandoned 1930 bridge operated through the same system, known as a Strauss Trunnion after the engineer who designed it. 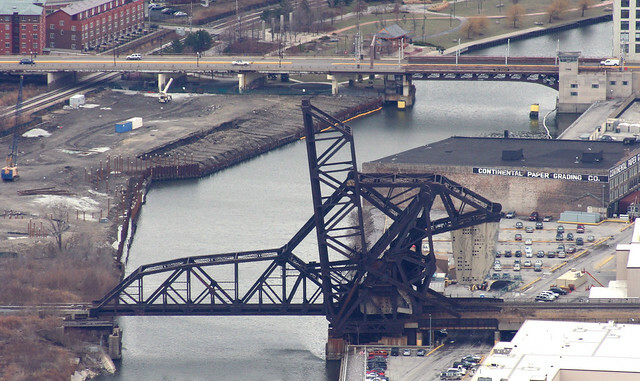 At a narrow stricture point, multiple rail lines once crossed the Indiana Harbor Canal on their approach to Chicago – a total of ten lines on five bridges. 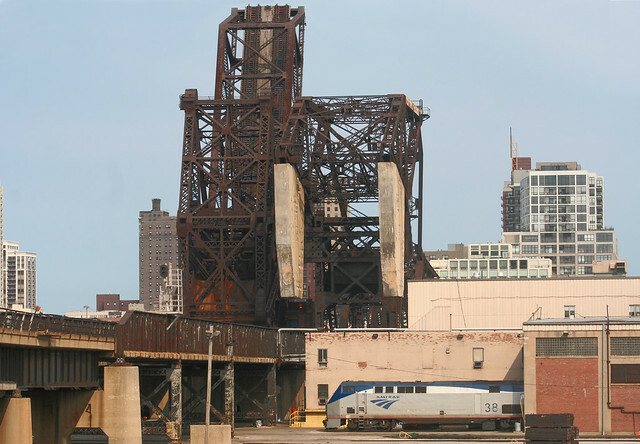 Only two of the bridges remain in service today, carrying three tracks and seeing heavy freight traffic from BNSF and Norfolk Southern, as well as eastbound Amtrak trains. 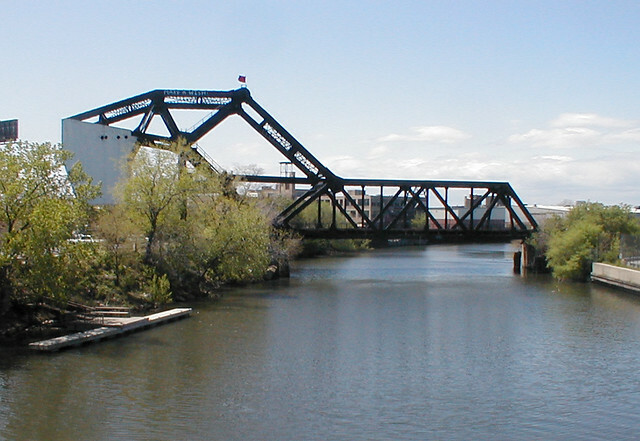 The majority of trains pass over the Norfolk Southern bridge, the silver-whitish one in the foreground. 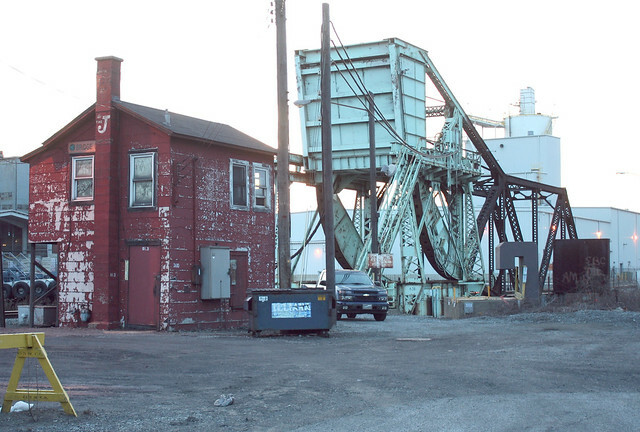 Behind it, the bridge with the greenish tint is an Elgin, Joliet & Eastern bridge, now owned by Canandian National. 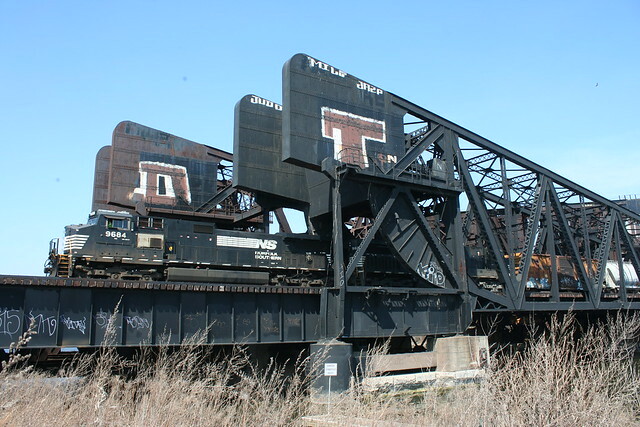 The box girder bridge was previously the Baltimore & Ohio main line; the two trestle bridges in front of it carried the New York Central. 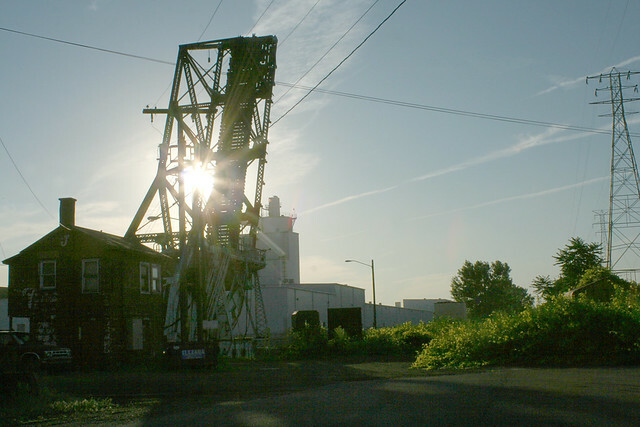 (ref) The structures in the background are ore unloaders for the steel mill. 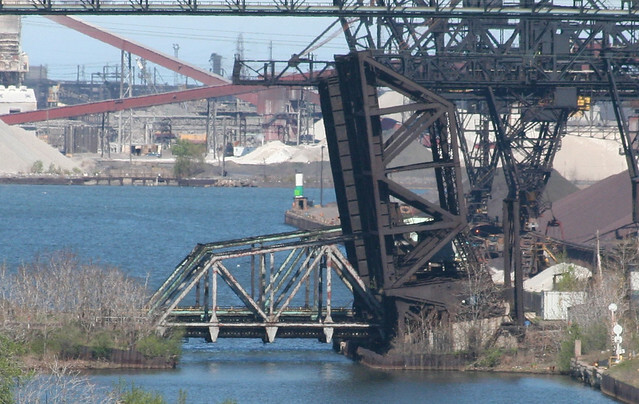 A sixth one was built in 2011 – a bright blue bascule bridge that directly serves the ArcelorMittal steel mills. It’s barely visible above, but a clear shot may be seen here. 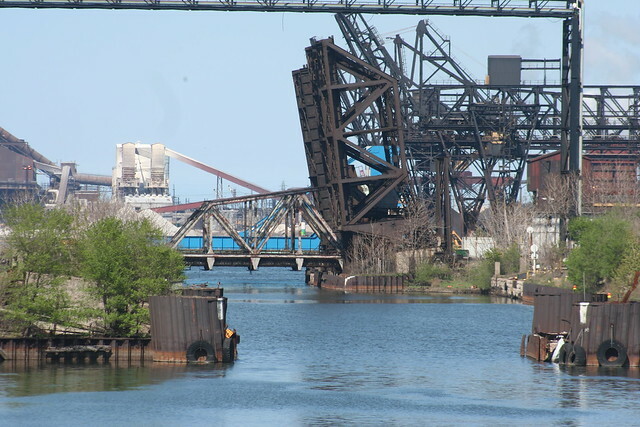 This fascinating group is difficult or impossible to reach without crossing a great deal of private property, or else taking a boat down the Indiana Harbor Canal – which, it just so happens, you can do this July if you take Forgotten Chicago’s Indiana Harbor Canal tour. A much smaller and isolated bridge, still operable and in use. A small example of the Sherzer Rolling Lift style. 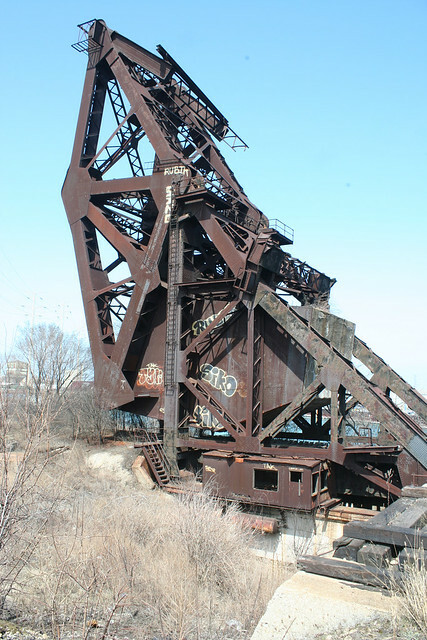 It stands alongside three vertical lift bridges… a topic we’ll cover next time! Our architectural office took a field trip down to Chinatown via water taxi and found the above info on the St. Charles Air Line and B &O bridges fascinating. I really appreciate your blog. Thank you for some amazing pictures and background on these impressive structures!